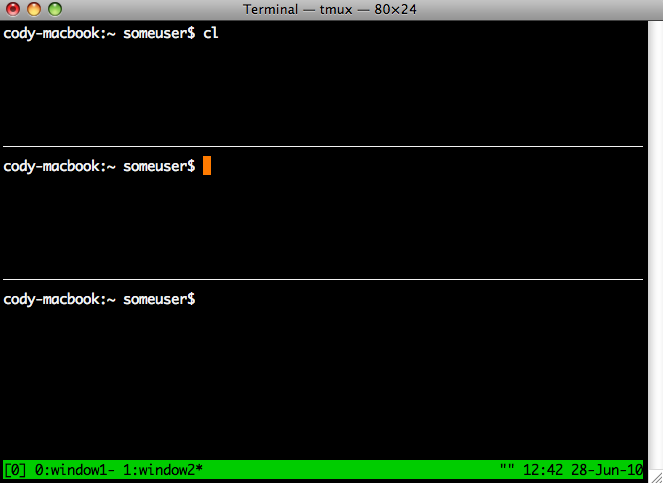 tmux is similar to screen as it lets you run numerous TTY’s in the same terminal window. It supports some very cool and intuitive features natively as well as a much more readable configuration syntax (ever looked at a .screenrc file?). A more usable status line syntax (which also allows you to embed the output of a shell command, handy indeed. Now these are pretty self explanatory – the real magic (for me) of tmux is the ease of modifying the default behavior to do what you want, but first things first: let’s explore the default behavior of tmux. 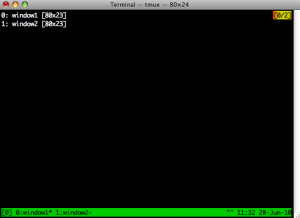 Start up tmux with the tmux command and you should be greeted with a simplistic terminal window that resembles screen – the only difference is it has a default status bar which is nice (easily added to screen as well). Now let’s create a couple of windows and go through them (we’ll be using the default bindings). Hit Ctrl-b c a few times to create a few windows, you should notice that there are more tabs in the status bar. Now if you’re like me you like to have descriptive names of which each window is for, so let’s rename them by hitting Ctrl-b ,. It should prompt you to rename the current window – type anything you want and hit enter. Now the current window is renamed to what you specified. Now going forward I’m going to have two windows open respectively named “window1” and “window2”. Now these ones fairly self explanatory however they don’t really cater to a lot of different windows. What if you have 10+ windows open? It becomes quite tedious to find the window you want – but don’t fret! 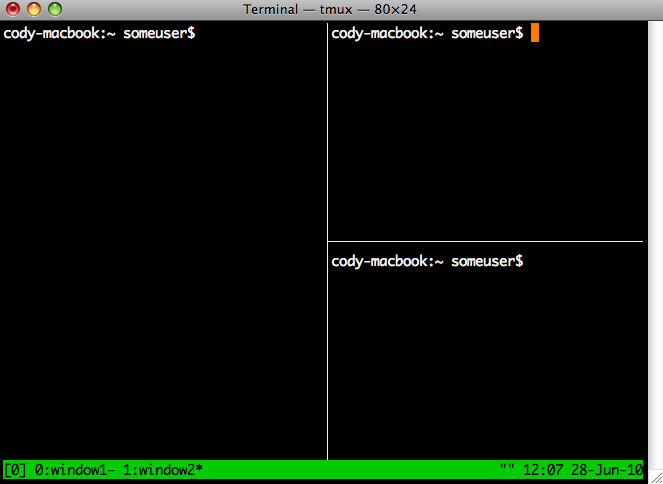 Tmux has a find-window option & keybinding. Type Ctrl-b f and type in the window name you want (it actually searches for the window so you can type in only part of the name of the window you’re looking for). You can also get a list of the windows in the current session by executing the list-windows command. To execute commands interactively you type Ctrl-b : which will bring up a text prompt. 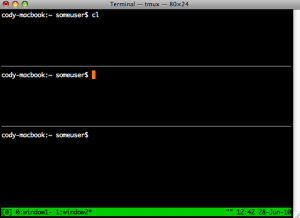 From there you can execute any command tmux supports interactively (tab completion is supported). Now some obviously the default bindings don’t encompass some of features, such as splitting horizontally. I personally rebind the keys so “|” splits the current window vertically, and “-” splits it horizontally. Not the easiest things to type, though easy to remember. 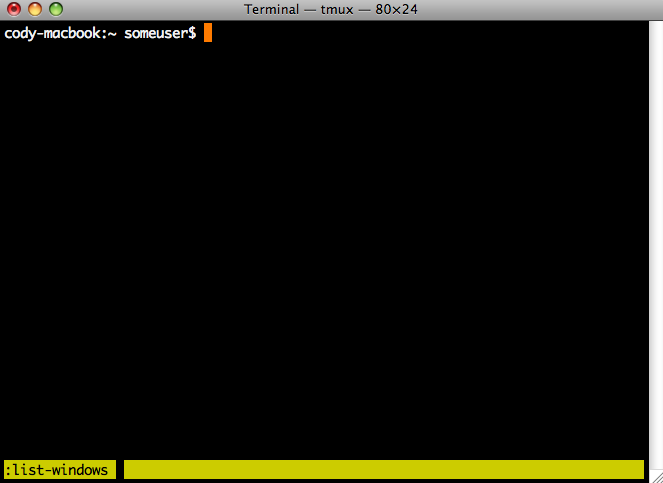 Now that we went over the basics lets dive a little deeper into some “advanced” features of tmux. This includes moving windows around, linking windows together, switching windows from different sessions and much more. By default tmux doesn’t have key bindings for these features, so we’ll be entering them in the interactive dialog (accessed by typing Ctrl-b :) – keep in mind tmux is very scriptable and you can easily create your own key bindings for all of these. Similar to the above command except both windows have to exist – if they both do the window with the ID source and destination windows will be swapped. Now that you’ve seen the different layouts let’s see what we can do with these panes. As mentioned above in the “Pane Handling” section you can switch through panes by issuing the Ctrl-b o key combination (which is using the down-pane command) or by typing Ctrl-b q which will list the pane ID’s and you select the one you want. Simple enough, you should now have the pane in its brand new window. If you don’t want it to automatically make the pane you just broke out as the active window issue the “-d” switch which will simply break the pane to a new window but keep you in the current window. Hopefully you get the jist – don’t get confused! 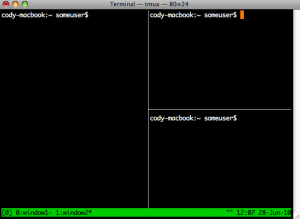 Simply load up a tmux session and split the window a couple of times and issue the above commands. It should become fairly evident how it behaves after fiddling with it for a bit. I’ve avoided mentioning that a lot of these commands can actually be applied to numerous tmux sessions which allows quite a bit of flexibility – the reason for avoiding it is it’s too much information all at once! An example of using this functionality is if you have two sessions open you can “link” or “move” windows across different sessions – unfortunately the actual “how-to” will be in Part 2. 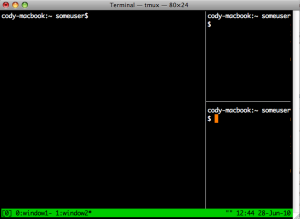 Tmux may be a bit confusing however it’s worth putting in a few minutes to check it out and see what it has to offer – quick easy and intuitive. This entry was posted in General, Tips and tagged linux, screen, Tips, tmux, tmux tutorial. Bookmark the permalink. @Brandon – I don’t receive an error strangely enough! I’ll modify the post however to reflect this as I may have been using an older package when I initially wrote it. Actually, it woud be set-option -g prefix C-a, in default keybindings section. Very nice information. Thanks. 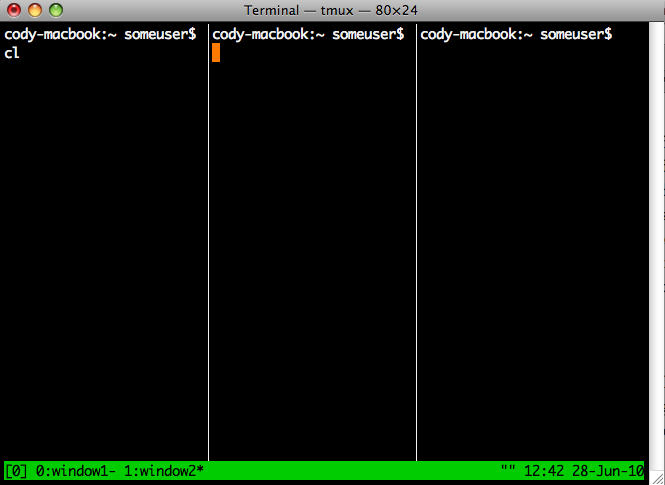 I am new to Tmux and your post has provided me with good start. thank you for this post. i literally just threw away screen forever. I, like the previous commenter thank you for writing this up. As of today, screen is no more! 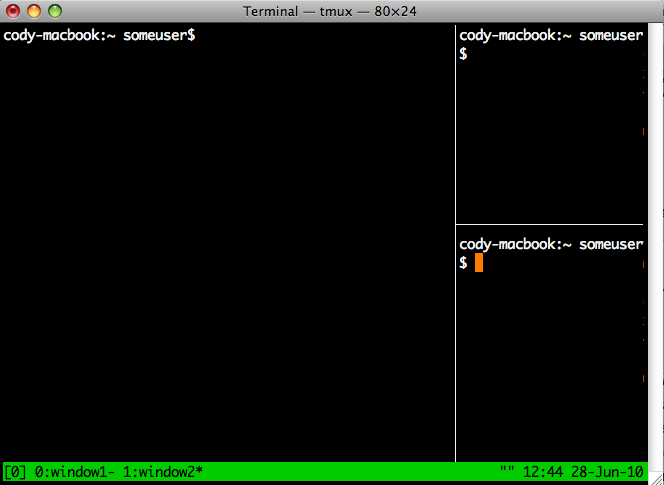 A friend suggested I take a look at tmux, which I’d heard about, but never tried. Shoulda done it much sooner… I’m sold on it! Found your post while as I was looking for startup guidance. Thanks for the tips… direct, succinct and most helpful. A useful shortcut I found on Dayid Alan’s cheat-sheet that you don’t mention here is Ctrl-b “ to split into left and right panes, similar to how Ctrl-b % splits into top and bottom panes; there’s no need to use Ctrl-b : split-window. 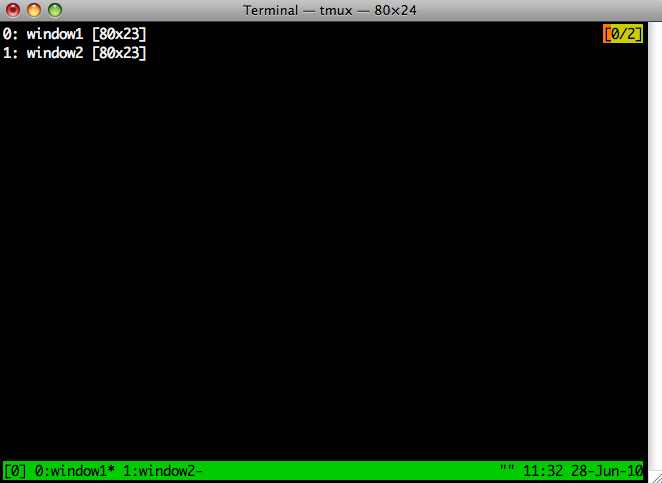 Good tutorial, I am starting with tmux, it has been a valuable resource. 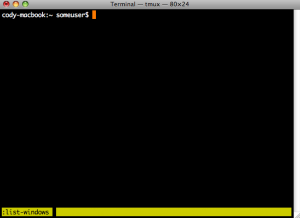 Pingback: Tmux scripting | Htbaa blogs? Pingback: Anyone familiar with splitvt? Nonsense. There is no such thing as intuitive keybindings. If anything, they may be familiar – that is, similar to something else you’ve used. But intuitive – that is, accessible without prior knowledge – no way. The tutorial is too nice ! i was stuck at horizontal pane and solved it just ! You might want to add that Ctrl-b c is supposed to mean press ctrl and b then c.
That part is not intuitive if you havent been in a program where you use that sort of keys. Previously i was using Screen for this task, but knowing features of tmux i want to give a start and your article helped me to start with tmux. 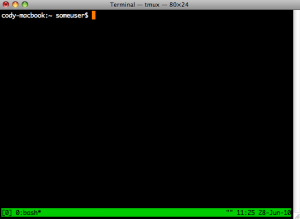 Screen and tmux both are nice but i think screen is light weight and easier to use. Thanks for the post, very useful to a newbie! Little question…. How I have opened the time (Ctrl-b t) – how do I exit this and get back to the window? I also end up stuck if I open shortcuts (Ctrl-b ? ), but I’m guessing the resolution to exiting the time will work for exiting the shortcuts. 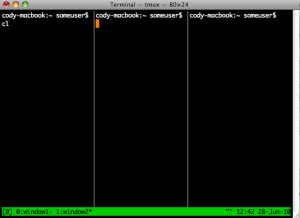 One difference I’ve noticed from screen is that tmux’s panes are contained inside a window, whereas in screen it’s (roughly) the other way around. Switching window in screen (ctrl-a “) will only change the contents of the current ‘pane’, whereas in tmux switching window (ctrl-b w) will swap from one set of panes to a different set. Just a quick note to add regarding the resizing of panes. If you hold down Ctrl+B & tap an arrow key you can easily resize the panes on the fly. This guy copied the entire post, changed some of the wording, made absolutely no meaningful modifications, and now ranks first in the search results for “tmux tutorial”. I mean, he copied *everything*, including the content, .tmux.conf customization, and even the entire last paragraph (verbatim). What a jackass. I just thought you should know that some idiot is stealing your content and your traffic, trying to legitimize it with a weaksauce link to this (original) post. 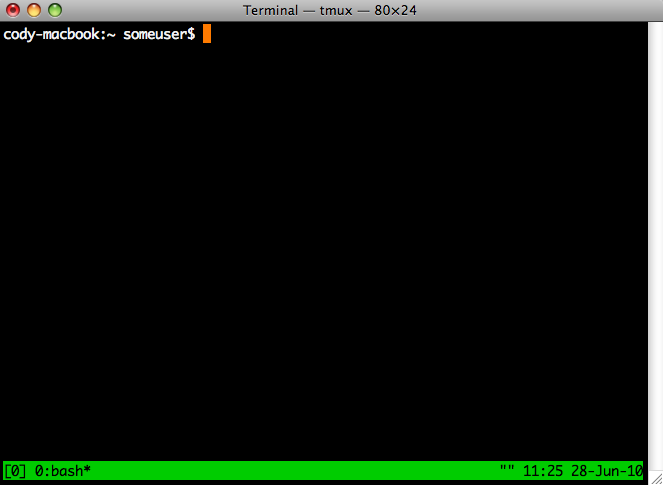 Hey, am using tmux for a day or two now… Here is my problem. I have split the screen into two vertical pane. On one pane I have a build going on which will put lot of logs on the pane & on the other window I am coding using vi. When there is lot of logs on the build pane, the control seems to ping pong between the panes. Because of this ping pong it becomes difficult to code on the other pane. Do you know a solution for this. ?